Fig. 1. 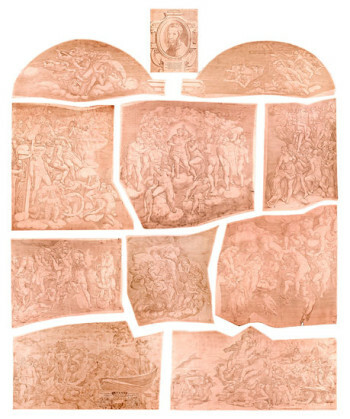 Giorgio Ghisi, Il Giudizio universale (Ghisi Composite) after Michelangelo (1549), 10 matrices and an additional portrait of Michelangelo, burin on copper, entire composition 122 x 107 cm. Rome, Istituto Nazionale per la Grafica, Inv. 201/1-11. Among the very first items accessioned by the Museum of Art Rhode Island School of Design (founded in 1877 along with the school where I teach) was a set of etchings by Salvator Rosa. 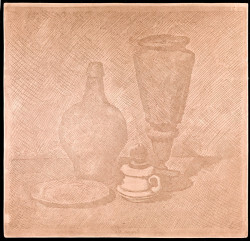 Although the artist made the plates in the 17th century, the impressions are from the 1870s, printed in reddish-brown ink on 19th century paper. These prints were made at the Calcografia in Rome, the world’s largest repository of printing matrices. 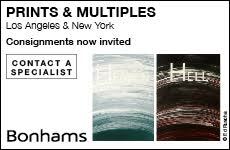 Subsequent curators have collected impressions made closer to the artist’s lifetime and our Calcografia Rosas are now catalogued as restrikes, but they continue to tell an important story about the early aspirations of collecting institutions in the United States. Just as casts of Classical and Renaissance sculpture were assembled to bring masterpieces of European art to American audiences, modern impressions of old plates had a significant place in America’s fledgling cultural institutions. RISD’s early acquisition of Rosa’s etchings is a small, if telling, episode in the long history of the Calcografia, now part of Rome’s Istituto Nationale per la Grafica. This collection of 23,400 printing matrices was assembled over centuries from a variety of sources. Pope Clement XII founded the Calcografia in 1738 with a cache of 9000 plates from the famed Roman print publisher De Rossi. The 19th century added collections of matrices by individual artists, including plates by Rosa, Volpato, Canova and Piranesi. In addition, new plates reproducing famous works of art and architecture were commissioned from leading Italian printmakers. Impressions from these plates were kept in stock and could be ordered. The Calcografia maintained plates in printing condition: popular plates were steel-faced to ensure longer printing life and plates deemed obscene by Papal censors received appropriate fig leaves. This pattern of collecting and printing continued into the 20th century. Impressions from the most popular plates were made as late as the 1970s when it was decided to cease printing and protect the matrices from further wear. Most importantly, the matrices of important artists such as Giorgio Morandi and Carlo Carra were added to the holdings. In 1986, some 700 plates produced by the Stamperia Romero in Rome were donated, documenting the activity of some of Italy’s most progressive artists from 1961 to its closing in the 80s. The Istituto continues to commission and publish new print projects in its studio while its scholarly mission embraces cutting edge technical and historical research. Fig. 2. Giovanni Benedetto Castiglione, Il Genio della Pittura (1648), etching on copper, 37.8 x 25.2 cm. Courtesy of Istituto Nazionale per la Grafica, Rome, VIC 369. 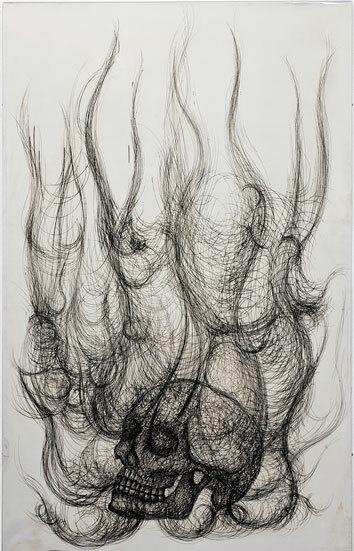 In the first exhibition of its kind, this Spring the Instituto joined with The Drawing Center in New York to mount “Drawing and Its Double,” an exhibition of 58 intaglio printing plates made between1528 to 1988 that prompts a reconsideration of matrices as art, and as objects of value to 21st century scholars, artists and general viewers. Printing matrices are an occasional feature of historical print exhibitions. Memorable examples include the engraved silver roundel in the Metropolitan Museum of Art’s 2003 Goltzius show and the heavily gouged plates in Yale University Art Gallery’s 2009 exhibition Pull of Experiment: Postwar American Printmaking. Having worked on displays including plates for the RISD Museum’s 2009 exhibition on engraving, The Brilliant Line (which traveled to Northwestern University’s Block Museum), I know how compelling visitors find the actual plates when they are struggling to understand what they are looking at in the prints. In these cases matrices were used to explain the objects on display. At the Drawing Center, curators Brett Littman, Ginevra Mariani and Antonella Renzitti took the plates out of the education cases and put them on the walls in a move that was simply radical. For an engraver, walking into an exhibition solely devoted to intaglio plates is an exhilarating experience. After all, the plate is the actual object I make when I work on a print. Though a handful of plates may get shown in historical exhibitions or at print fairs, their surfaces are often obscured by dried ink, tarnish, or varnishes, or they are disfigured by cancellation marks or submerged in deep glass cases. The Calcografia plates are beautifully clean and many of them have not been steel plated to prevent wear. They were mounted in acrylic and hung on the wall, making it possible to take in the entire object as well as the details. To see the tool marks of the masters was a rare privilege. I had many questions about depth of line, layering of marks, spacing and effects of wear as I examined the plates with the Optivisor I always carry when I look at prints. The Drawing Center, thoughtfully, had magnifiers on hand for visitors who were not so well equipped. Fig. 3. Arnold Van Westerhout, Nuova raccolta di varie e diverse sorti di fiori (1631), etching on copper, 29.9 x 20.6 cm. Courtesy of Istituto Nazionale per la Grafica, Rome, VIC 1469/8. The exhibition opened with the plates for Giorgio Ghisi’s magnificent engraving (c. 1548) after Michelangelo’s Last Judgment in the Sistine Chapel (Fig. 1). Distributed over 10 irregular shaped plates, the entire assemblage is over a meter wide. Fine impressions of the complete set are extremely rare. This popular print was issued many times and the plates were probably well worn by the time they entered the Calcografia. Perhaps it is only when viewed as a group of plates that the image has such a strong impact. The oversize scale of the multiple matrices gives some idea of the grandeur of Michelangelo’s invention, while the puzzle-like interlocking shapes imply the seams of the giornata (day’s work) in the fresco. It is an imposing sculptural object, with a physical presence that is only rivaled by some of the experimental shaped plates from the 1970s, such as those by Umberto Mastroianni and Nino Franchina. Plates for famous prints by Frederico Barocci, Pietro Testa, Rosa and Giovanni Benedetto Castiglione chronicled high points in the development of Italian etching in the 16th and 17th centuries, but also made the point that sometimes paper trumps plates, if the paper was pulled early on and the plate had a hard life. The feathery touches in Castiglione’s plate for Il Genio della Pitura (1648; Fig. 2) are still evident, but in other examples, such as the Barocci Annunciation of 1584/88, the lines are worn and perhaps retouched, suggesting that the image would be better studied in a fine, early impression than in the plate itself. The surprise stars of this section were by lesser-known artists. Arnold van Westerhout’s flower studies after Jacques Bailly (1631; Fig. 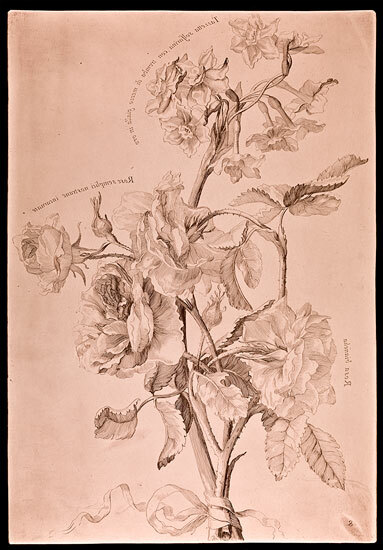 3), offered graceful mixed bouquets rendered in etching, the forms delicately outlined and shaded without cross hatching. Pure engraving was reserved for the exquisite calligraphy surrounding the plants. Another highlight was an allegorical frontispiece for a book of artistic anatomy attributed to François Andriot after a sketch by Charles Errard and dated 1691 (Fig. 4). 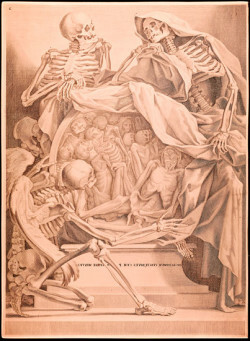 This image depicts a sculptural group of three skeletons around a draped relief of flayed bodies. It is rendered with incredibly precise burin work. Its near pristine state of preservation allowed one to study the multiple engraved levels that differentiate areas of shadow, middle tone and light. Fig. 4. François Andriot (attr. ), Anatomia per uso et intelligenza del disegno (c. 1691), after Charles Errand, burin on copper, 32.5 x 23.8 cm. Courtesy of Istituto Nazionale per la Grafica, Rome, VIC 1164/2. Piranesi was, of course, a central figure. 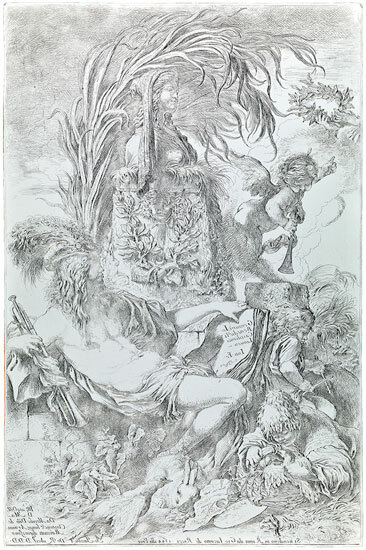 (see Messing About With Masterpieces: New Work by Giambattista Piranesi) A double-sided plate illustrated the two sides of his character: the comparatively staid Piazza di Monte Cavallo showed him as the master of the Roman view. Staged biting created deep atmospheric space and Piranesi’s technique of etching linear textures into his exceptionally wide lines to make them hold ink is evident in the foreground forms. 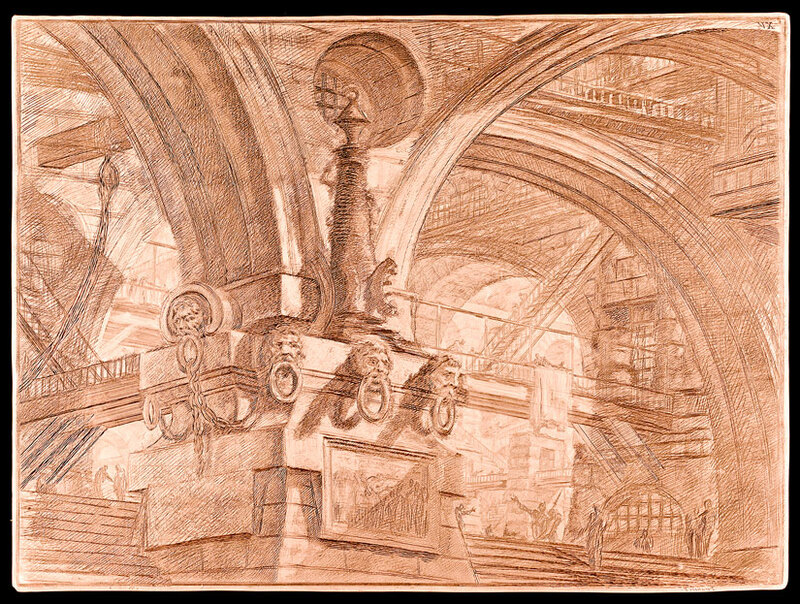 The backside of the plate was also etched, though this was only discovered in the mid-1960s during an inventory of Piranesi’s plates. The image, La caduta di Feronte, was finally catalogued and a few impressions were printed. It is in the florid rococo style of the Grotteschi and like that series is dated c. 1748. The scratchy lines were bitten to many levels and there seems to be some damage that happened in the acid bath, but it is a marvelous, rhythmic image in which figure, earth, architecture, water, foliage and clouds swirl in harmony. Apparently, it was not published in Piranesi’s lifetime, perhaps because the artist did not consider it publishable. Turning from this plate to the next in the exhibition, we watch an artist at the point of failure leap from the muddiness of the unpublished plate to the brilliant transparency of Carceri XV (Fig. 5). First worked on in 1749-50 and reworked by 1761, the Carceri plate was a revelation for me, having studied impressions of the two states of the print over many years. Because the later revisions were etched more deeply, they cut through the original lines. On paper the earlier work is less apparent. On the plate the two states seem to exist simultaneously. Fig. 5. 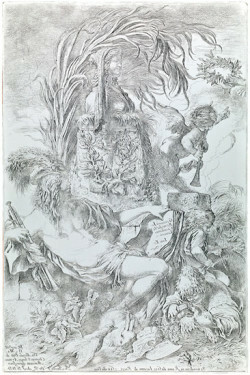 Giovanni Battista Piranesi, Capriccio con pilastro ornato con mascheroni, pl. XV delle Carceri (1749/50-1761), etching and burin on copper, 41.6 x 55.8 cm. Courtesy of Istituto Nazionale per la Grafica, Rome, VIC 1400/363. The 19th century witnessed both the pinnacle of virtuoso reproductive engraving and its swan song. The most stunning example of this genre is Giovanni Folo’s plate after Antonio Canova’s sculpture Ercole e Lica (Fig. 6), completed before the engraver’s death in 1836. 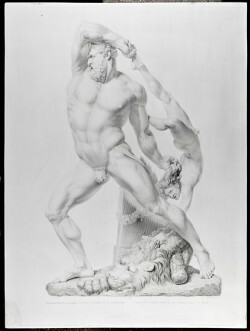 Canova carefully supervised the production of prints after his sculptures, directing draftsmen such as Giovanni Tognoli, who made the drawing for this engraving. Emphasizing the importance of silhouette in his sculptural compositions, Canova chose an ideal vantage point for translation from three into two dimensions. The contour is not indicated by an outline or even by a dark background, as in the French engraver Charles Cléement Bervic’s 1809 engraving of the Laocoon. Instead the image is articulated by a complex system of curving lines, dots and dashes that, even in the darkest areas, maintains an open middle tone. The tension between a calligraphic, ultimately flat configurationa and profound volumetric rendering is especially evident when seen on the steel-plated copper in the exhibition. The image is absolutely holographic from certain points of view. Fig. 6. 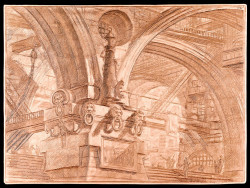 Giovanni Folo, preparatory drawing by Giovanni Tognoli, Eracle e Lyca (post 1841), after Antonio Canova, etching and burin on steelified copper, 63.1 x 47.6 cm. Courtesy of Istituto Nazionale per la Grafica, Rome, VIC 1287. Looking from Palazzi to the masterpieces of Giorgio Morandi, it was clear that Morandi’s approach to plate making harks back to the work of the earlier artists in the exhibition. Calculated spacing, layering and width of lines were the secret to his carefully controlled range of values. Everything was etched in the plates, requiring a clean wipe for the ideal impression. Morandi cherished the freshness of the lines made on the first ground and the unity results from a plate placed in the acid bath just once. This relationship of graphic clarity to Morandi’s etching technique is most striking in Paesaggio sul Savenna (1929; Fig. 7). The acid cut extremely clean channels which all seem to go to the same depth. The final section of the exhibition, consisting of Italian prints from 1966 to 1988, revealed works that are almost unknown to American viewers. The vigorous working of many of these plates through deep biting, cutting, shaping and inlay brought to mind prints made under the influence of Stanley William Hayter and Atelier 17 in France, the United States and the UK, but the Italian prints are less reliant on burin engraving for their technique or Surrealism for their imagery. Aquisgrana (1971) by Nino Franchina consists of two interlocking spiky forms made of welded steel. The matrix has remarkable sculptural presence as does the plate for Guido Strazza’s 1988 Studio relativa a Roma, which contrasts etched and drypointed lines representing shadow and movement with solid planes created by zinc inlay. Emphasising the sculptural qualities inherent in all intaglio plates, these works brought the exhibition full circle by relating to Ghisi’s shaped plates for the Last Judgment. Fig. 7. 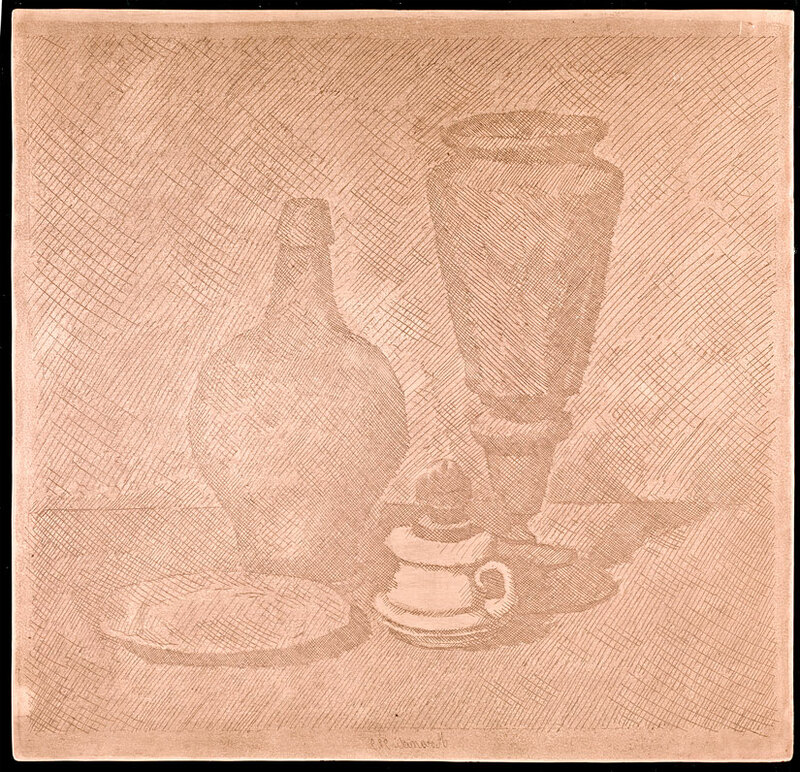 Giorgio Morandi, Natura morta con vaso, lumino e piatto (verso) (1929), etching and aquatint on copper, 24.9 x 25.8 cm. Courtesy of Istituto Nazionale per la Grafica, Rome, VIC 1799/30r. “Drawing and its Double” demonstrates how much can be learned by looking at a matrix that cannot be learned by looking at a fine impression of the plate. Recent art historical exploration of the matrix includes Mei-Ying Sung’s study, William Blake and the Art of Engraving.2 Sung examines all of Blake’s extant plates (with special attention to The Book of Job, 1826) looking at their backs for hammer marks that show where the front surface had to be made flush after copper had been removed to make a correction. Comparison with plates by Blake’s contemporaries shows that Blake corrected with great freedom, demonstrating an extraordinary creative flexibility within his exacting medium. The same point could probably be made by examining a series of state proofs, but by going to the primary source, the objects Blake saw as he was working, Sung makes a compelling argument that Blake’s passion for the physical act of engraving, the trade that he had learned as an apprentice and that supported him throughout his life, was equal to the intensity he brought to his more celebrated work with experimental techniques. From my point of view as a printmaker, it is very interesting to study a plate and observe the autographic qualities of each engraver’s work. This individuality exists on an almost microscopic level involving relative evenness of spacing, smoothness of lines and the commencement and termination of marks. Looking at a plate can help to distinguish between engraving and etching, something that can be very confusing when looking at impressions of mixed method prints. In examining engraved plates I try to determine the sequence of cuts in passages of layered hatching. It is often possible to see where the engraver has re-entered a line with the burin because the groove appears somewhat rough in the plate even when it prints as a smooth line on the paper. Exacting measurements can even determine the profile of a cut to find out whether the engraver used a square or lozenge shaped burin. If the opportunity to examine these plates was so unusual for a seasoned practitioner, it must have been extremely novel for the general public. The images on most of the plates were not obvious from a conventional viewing distance and close looking was clearly required. I observed visitors using the magnifiers provided and quickly becoming engrossed in the details of each artist’s handwork. Engravings by Andriot, Volpato, Folo and Poretti dazzled the eye with the superhuman precision and intricacy of their marks. Even more compelling was the visceral immediacy evoked by the etched lines in plates by Piranesi, Carra, and the deeply-bitten expressive gestures in plates of the 60s and 70s by Afro Basaldella and Giulio Turcato. Fig. 8. Paolo Canevari, Burning Skull (2008), from the Decalogo series, etched copper and dry-point, nickel-plated, 138 x 88 x 2 cm. Courtesy of the artist and Gallery Christian Stein, Milan. The most profound question raised by Drawing and its Double is whether a matrix is actually a work of art and if so, what kind of work is it? In addition to the historical material, the exhibition also included Decalogo (2008) (Fig. 8) an installation of ten large etched plates by Paolo Canevari, (commissioned by the Istituto and produced at the Calcografia with the assistance of master printer Antonio Sannino), which supplies one answer to this question. 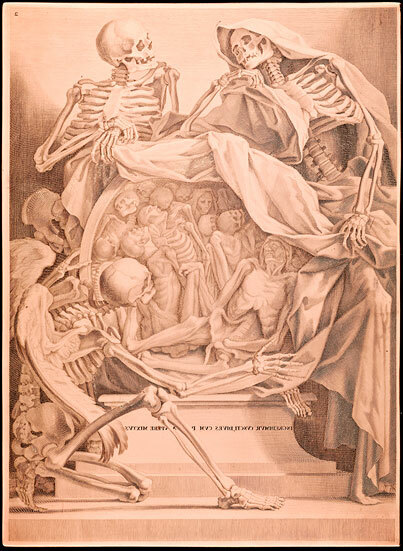 Canevari etched and drypointed highly charged images—a skull, cross, the Collosseum, The Bible and Mein Kampf, most engulfed in flames—onto ten large (almost 3 x 5 feet) polished copperplates. The plates received a reflective nickel plating and were bent at the edges and mounted so they stood out from the wall. The incised lines, depicting whirls of smoke that contrast with solid forms, are inked as for printing in order to make the images more visible. At the same time, viewers, reflected in the plates, become part of the images as they look. Clearly, though they refer to prints through their materials and technique, here the plates are the primary objects. The historical plates have a more equivocal status. They are striking for their physical presence, their tactile, highly wrought qualities as objects. Many of them are strongly sculptural and all of them have subtle qualities of relief. They employ drawing skills in their making, but they are not quite the same as drawings. Their makers understood them as three-dimensional utilitarian objects, manipulating both images and three-dimensionality in reverse in order to impress images onto surfaces. If they are not quite drawings, it has to be said they are also not quite sculptures. Even though the makers may have spent months and even years working on the metal, the primary object was always the graphic work on paper. For the platemaker to lose sight of this goal would be disastrous, resulting in a piece of decorated metalwork rather than a print. Matrices, and by extension the prints they produce, have a unique and curious identity in relation to other classes of art objects. The matrix and every print pulled from it constitute the entire work of art. This is true even when they are permanently dispersed or some elements in the series are lost. (Sculptor Jonathan Bonner touched on this idea in a recent project in which he had a professional lettering specialist engrave palindromes on copperplates. The plates were printed in an edition of one and the plate and proof were framed together, uniting the plate and the print as a single entity.) Every plate in the Drawing Center exhibition is intimately linked to the impressions it has made, perhaps occasionally numbering in the thousands, often over many centuries. It was only after looking at the plates on view that I remembered not only the Salvator Rosas at the RISD Museum, but also the many hundreds of impressions I had seen from these matrices over the years in museums, private collections and on the market. Being in the presence of the plate, the site of production, made me powerfully aware of the point at which each individual print started its path in the world.